Here's the Pivot connected to the extension. Works great and it's solid with no sway. The only thing I don't like is the need for another locking hitch pin. Just did a couple of modifications to add a Aluminess box to our rack attach as we needed extra storage for a recent trip to Moab. Came in very useful and am going to add a support wheel to the outside to support the weight when swinging it out.Also use it for a dog ramp I made as it is all about the dog! FYI, Yakima now also sells a swing-away 2” receiver arm, called the Swing Daddy. I’m using one in conjunction with a Dr Tray platform bike rack on my SMB. Clears the read door mounted spare tire (old school tire mount, not an Aluminess). I’ve been looking into one of these swing away hitches, either the rakattach or the kuat. 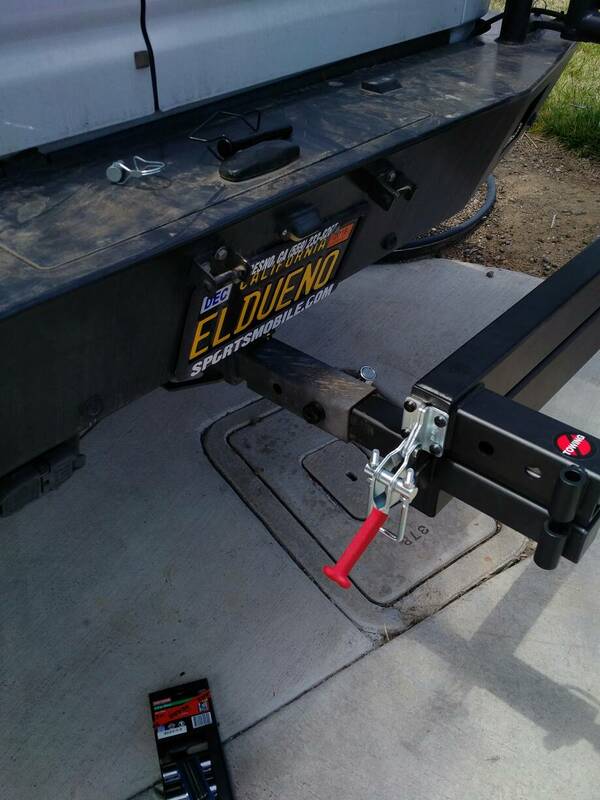 We have the rear aliminess bumper with the deluxe box and spare tire carrier. Am I reading correctly that the size Large RakAttach still isn’t big enough for this setup? And the Kuat is basically a size Medium? Rakattach used to make an extended/longer version to accommodate the Aluminess bumper/spare tire/big box on the back but I understand they don't make it anymore. I got one before they stopped that swings open to the left side of the van rather than the right. Makes it nice to get into the back of the van while camping and makes for easier access to the contents of the deluxe box. Normally, I only use it when we go camping as that is the only time we really need access to be back doors. For the time where we just go biking, I simply put the 1up bike rack on with a short extension so it clears the rear box. Bummer! Well, they have 3 sizes now (S/M/L) and you can choose either passenger or driver side swing out. I think I’ll email them though and see if they have any suggestions. A lot of money obviously need to make sure it’s going to do what I need. They do have a figment guide with measurements too maybe I’ll see if that helps at all. I have the Kuat and I definitely need a hitch extension to clear the Aluminess Deluxe Box on the back. Not a big deal but it adds an extra locking pin that needs to go on to keep things from walking away. Actually looking at the fitment specs for the kuat and the rakattach the kuat is slightly larger. The downside is the kuat appears to only be available in a passenger side swing out, whereas the rakattach you can get in either driver or passenger. REI carries the Kuat, which is $60 cheaper to start and the 20% coupon during their mid May anniversary sale would save another $60. So $120 cheaper for the kuat, but would need an extension to clear the deluxe box. Might have to be patient and go that direction.